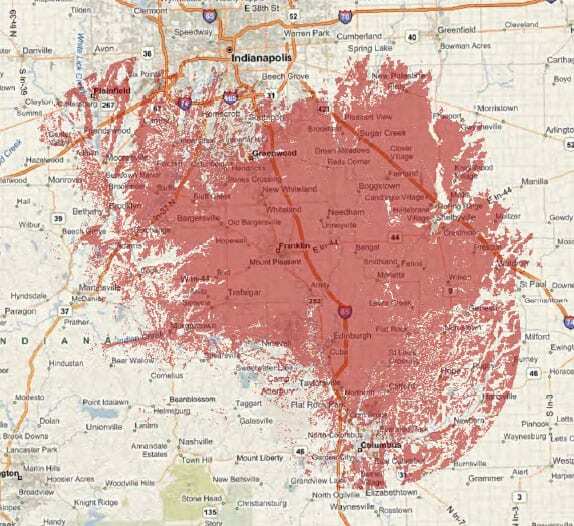 Central Indiana's Wireless Broadband Internet Service - Internet Communications, Inc.
We Will Beat Any Non-Bundled Price You Bring Us! Internet <strong><em>solutions</em></strong> for your home or business! At Internet Communications Inc., we specialize in fixed wireless for both your home and your business! Whether you’re looking to stream video or make sure your office WiFi never slows down your workflow, you can trust our cutting edge equipment and knowledgeable staff to meet your internet service needs. Certain areas inside the city limits may not currently be available due to trees and buildings, but our coverage area is expanding every day. We are improving this map daily, so if you are not in the red shaded area shown please contact us! We can look up your address and get a much better idea about your internet service options than this map may provide. At Internet Communications Inc., we strive to provide the best internet services, in speed and affordability, for the Franklin, Indiana area. You can find us in all of these Indiana counties! Call us to learn more about availability. Blazing fast speeds to the most used websites. You probably didn't know that our company network has independent fiber backbones that feed into our 10Gig network at the Indianapolis Lifeline Data center. In doing this, we have peered into the local IX where our customers have access to faster routes to companies like Netflix, Cloudflare, Akamai, Hurricane Electric, Indiana Gigapop, Google, and Microsoft. This gives our customers speeds that normal Internet Service Providers can only dream of offering. Surf the web and stream your favorite shows and movies in a fraction of the time it used to take with your old internet service. ICI offers high speed wireless service. Our hardware is installed at your office or residence in line of sight with one of our towers. Speeds up to 1 Gbps available. A perfect option if you don't currently have a Broadband connection or you are looking to replace your DSL or Cable Broadband service.